Yoga is an ancient art that has been refined and modified by many great teachers across the ages. It now comes in so many different styles and techniques and different people may find different versions of Yoga more suitable for them. This is because Yoga is a very personal exercise routine with strong emphasis on looking within oneself in order to achieve personal balance and wellbeing. Regardless of which individual version of Yoga you practice there are a number of things that apply to Yoga universally rather than to individual branches of the discipline. If you want to get the most from your Yoga session you will learn to understand these things and develop them into your Yoga routine. You will find that much of your time performing Yoga is spent in a sitting or lying position, however the beginning of a Yoga session is usually a standard standing pose. The standing pose is the most natural position for a human to find themselves in, yet we spend remarkably little time practicing standing correctly. If you begin your Yoga session with a standing pose you are free from the stress of having to take on an unaccustomed position and this allows you to focus on other fundamentals of the Yoga Discipline. For instance you can concentrate on regulating your breathing and feeling the full healing benefits of each breath. The standing pose is so natural to us that we don't need to pay it any conscious thought and can focus on our breath entering the body and flowing through us. The standing pose is also beneficial to bringing the body into alignment and centering ourselves both physically and spiritually. Leonardo Da Vinci produced a famous diagram showing the perfect symmetry of the human body when it is in its natural standing pose and this position has always been the most natural for us to find our center and balance. The bulk of a Yoga session is spent in placing our body in positions or poses that stretch and activate the body. These poses are entered into gently and gradually so there is no risk of injury. Many poses have a number of different levels so we can get more and more benefits from them as our body becomes more used to them. This is perhaps best demonstrated by a simple forward stretch. When a gym teacher tells a pupil to touch their toes the pupil is performing the same exercise whether they can reach forward and touch the floor or whether the stretch only goes as far as their knees. The only difference is the level of incline. The forward stretch is also a perfect example of how the natural movements of Yoga are used outside of a Yoga class or session - in this case in stretching and warming up before sports or other physical activities. Most children whose coaches take them through a stretching routine before a game of football have no idea that many of the poses are borrowed directly from a Yoga session. The key to enjoying and benefiting from this main phase of the Yoga session is to pace it to your level. As with the child who can only forward stretch to knee level you do not need to perform the exercise at the highest level from the first time you experience it. Find your comfort zone and then move a fraction beyond it. Then each new session try and maintain that level and push a little further if possible. The end of a Yoga session is also an important stage. This stage usually consists of a group of restoration and restorative poses and positions that are designed to allow the energy to flow back through your body. 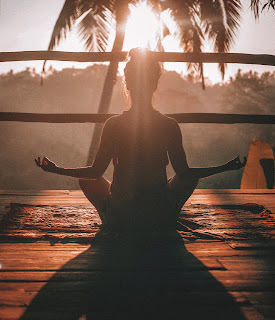 A good Yoga session releases pent up energy in your body and allowing this energy to flow freely to all parts of the body is a critical part of gaining the maximum benefits from Yoga.